Compact but powerful ATV winch that will serve you faithfully is exactly about Warn Vantage 3000. It will pull you out of any trouble and will do this at a quite affordable cost. All Vantage series winches stand out at the market thanks to their price-quality ratio. If are going to buy a winch from the American producer and still have doubts whether Warn Vantage 3000 is the best deal ever, check out its characteristics first. 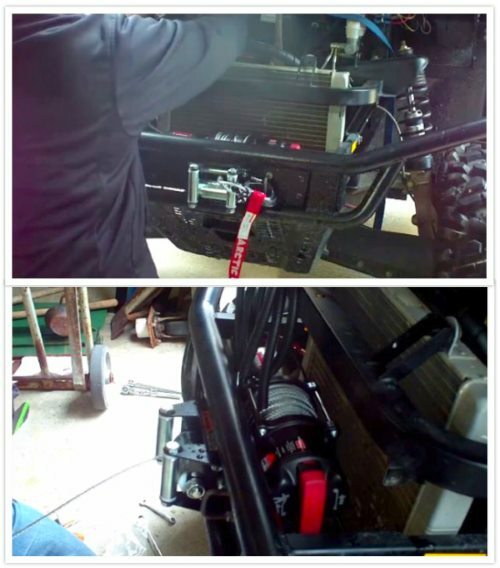 When you will get the kit, you will see that it includes a winch with a steel cable, a hook with a protection for the hands, a block of solenoids, roller guides, a winch installation site, a wire control panel, a set of power cables, all the necessary technical documentation. Is Vantage 3000 The Winch You Would Like to See on Your ATV? Electric winch Vantage 3000 has been designed for ATV, UTV, and snowmobiles with power from 12V DC and maximum force of 1361 kg. The model is equipped with an electric motor on permanent magnets and a three-stage planetary gearbox, which are equipped with seals and sealing elements to ensure the hermeticity of the housing. 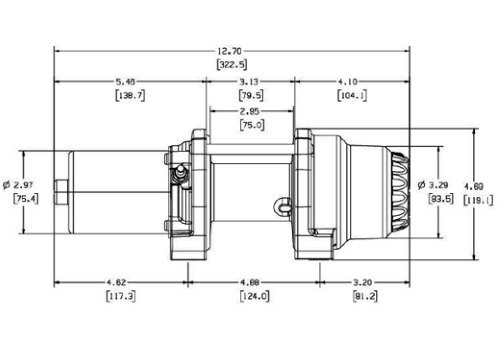 The factory equipment includes a steel cable 15 m long and 5 mm in diameter, as well as roller guides. The control of the unit is on the steering wheel, using the switch that comes with the winch. The brake is mechanical, on springs. The winding speed is from 1.5 m / min. The inclusion of free unwinding – the swivel mechanism on the side of the unit. 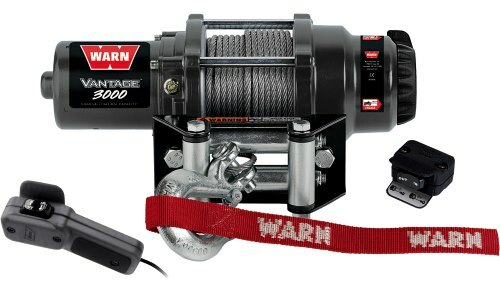 If you want to get a powerful winch that is reasonably priced, then Vantage 3000 is a good device to give preference to. Getting a winch of this series, you are guaranteed to enjoy the proven quality and dependability. Either you are going to use your winch for pulling, lifting or dragging, Vantage device will be able to give you a helping hand with anything anywhere and in any weather conditions. Sounds great, doesn’t it? You may wonder if it is really so perfect. No doubts that it works as the producer claims. According to winch users, it has many pros to enjoy and only one only con that is an absence of a mounting plate kit. Take this into account when making the final choice. Never thought I would have to ask such a basic question. Broke the wire winch cable on my Warn 3000 winch and can’t remove the old cable from the spool. Did a search and found mention of a puck holding the cable in the spool but do you need to remove and disassemble the winch to get the old cable out through the inside of the spool? I am going to replace with another wire cable ( guess it isn’t a Warn wire cable that I bought ) but it just has nothing on the spool end of the cable just looks like if you would cut it off with a cut-off disc. Am I missing something here and do I need to have a Warn brand wire cable to replace the old one? Thanks for any help anyone can provide. I have replaced my cable. I removed the winch from the quad to make it easier to work on. Once the cable is unwound, I shot some WD-40 into the hole and wiggled the cable, pushing it through to remove the puck on the other side. I cleaned out the hole before installing the new cable. I used a battery box to operate the motor so I can wind in the new cable. If you want to do this with the winch still installed, remove your fairleads and that should give you the room needed. Vantage 3000: Should You Choose It as Your Off-Road Partner? Vantage 3000 is a good choice for those who ride bigger ATVs like Yamaha Grizzly 350 and think that the Warn model with the pulling power 2000 lbs won’t be able to satisfy all their wants and needs. Vantage series with 3000 lbs pulling capacity will perfectly suit serious riders. Either you use your vehicle for hunting or to do some work, this winch will not let you down as it has permanent magnet motor and is a workhorse you can rely on in any emergency. There are no such weather conditions, which can prevent Vantage 3000 from showing good results. Getting the reviewed model you receive a pretty good deal as the durability and reliability cost exactly as much as the Warn winch of Vantage series.